Here is a list of key awards and other recognition received by Adam Dettrick Architects. Movida Sydney is a finalist in the 2014 Sydney Design Awards. Narrabundah House shortlisted for 2014 Houses Awards. MoVida Sydney shortlisted for the 2014 Australian Interior Design Awards, Hospitality Category. Congratulations MoVida! Premier's Sustainability Prize 2012, Built Environment – Design category: Cape Paterson Ecovillage. Congratulations to our client, Cape Paterson Partnership for winning this award. Narrabundah House awarded the 2014 ACT Architecture Award for Residential - New projects. Regional Prize,Victorian Architecture Awards 2011. Most Outstanding Ecologically Sustainable Lifestyle Village, 2010 Australasian Over 50's Housing Awards. Dalkeith Heights Lifestyle Village, Traralgon. 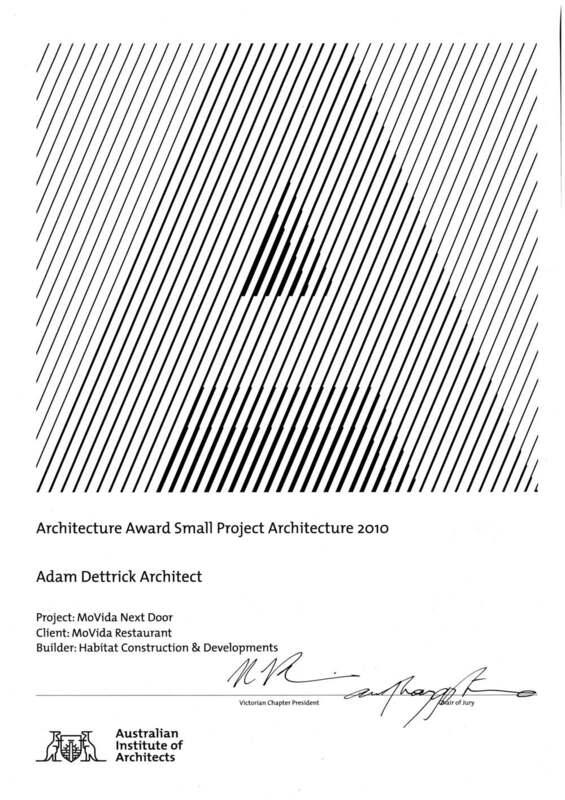 Small Project Award, Victorian Architecture Awards 2010. Shortlisted: 2012 Transiting Cities international design ideas competition: Proposing ideas to achieve a low carbon future for Latrobe City, Victoria. Shortlisted: Proposition 3047 - National Architecture Competition, 2006: Shortlisted architects for the design of a new city centre for the Melbourne suburb of Broadmeadows.